Manufacturer of a wide range of products which include harley davidson paper painting, radha krishna paper painting, maharani paper painting, god paper paintings, lady huqa paper painting and old paper painting. With highly equipped artists and the wide range of colours. 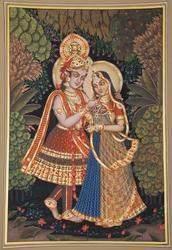 Backed by our flourishing business processes, we are able to offer Radha Krishna Paper Painting. Offered painting is designed by our experts by making use of excellent quality material & leading techniques as per the trends of market. 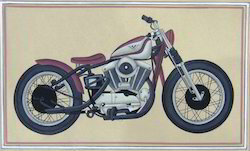 This painting is accessible on several designs & finishes in fulfillment with the needs of customers. Moreover, our painting is checked from end before dispatching to customers so as to deliver a perfect range. 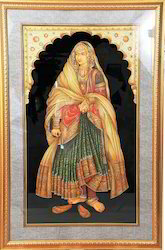 Our company manufactures and exports a vast assortment of Amritsari Paper Painting that are available as per the client’s specific requirements. These paintings are made using excellent quality colors and precious gemstones that are procured from the reliable vendors. Our paintings are made to perfection and these are available with good color combination. We create them using natural dyes as well as beautiful color paints. Radha krishna paintings on old paper with description of scene in sanskrit written. 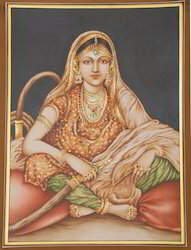 We are involved in manufacturing and exporting a huge range of Lady Portraits that are designed to perfection. Available with unique designs, these paintings are manufactured for decorative applications and we offer them at cost effective prices to the clients of national as well as overseas market. Our paintings are widely accepted for their easy maintenance and these are provided within specified time period to our valuable clients. Radha krishna paintings collection on old paper with sanskrit written . 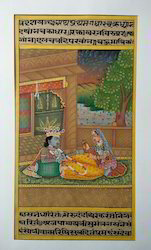 Radha krishna painting on old paper with the description on scene in sanskrit written. Radha krishna paintings on old paper with description of scene in sanskrit written . 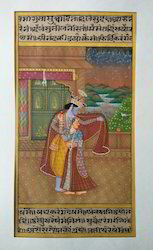 Looking for Paper Painting ?